The extract of the resin of the Boswellia serrata tree in Hervedics Boswella helps block the synthesis of 5-lipoxygenase and other inflammatory activities. 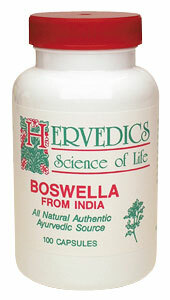 The boswellic acids support chronic colitis, IBS, rheumatoid arthritis, osteoarthritis and asthma. Purchasing this product today earns you 29 DR Reward Points! Other Ingredients: ditab, sylox 15~ silicon dioxide, tricalcium phosphate, magnesium stearate. Cotains no common allergens. One capsule 3 times a day with meals. 3. Ann Rheum Dis. 2004 Feb;63(2):200-5. 6. Ann N Y Acad Sci. 2004 Dec;1035:104-16. Review. 7. Phys Sportsmed. 2008 Dec;36(1):11-7. 9. Boswellia serrata, a potential antiinflammatory agent: an overview. 10. Boswellia serrata: an overall assessment of in vitro, preclinical, pharmacokinetic and clinical data. 11. Effects of gum resin of Boswellia serrata in patients with chronic colitis. 12. Effects of Boswellia serrata gum resin in patients with ulcerative colitis. 13. Clinical evaluation of Boswellia serrata (Shallaki) resin in the management of Sandhivata (osteoarthritis). 14. Effects of Boswellia serrata gum resin in patients with bronchial asthma: results of a double-blind, placebo-controlled, 6-week clinical study. 15. Long-term efficacy of Boswellia serrata in four patients with chronic cluster headache. 91. Wien Med Wochenschr. 2002;152(15-16):373-8. 92. Planta Med. 2001 Jul;67(5):391-5. 93. Planta Med. 2000 Mar;66(2):110-3. 94. Eur J Med Res. 1998 Nov 17;3(11):511-4. 95. Eur J Med Res. 1997 Jan;2(1):37-43. 96. J Ethnopharmacol. 1993 Mar;38(2-3):113-9. 97. J Pharmacol Exp Ther. 1992 Jun;261(3):1143-6. 98. Planta Med. 1991 Jun;57(3):203-7. 99. Biochem Pharmacol. 2008 Jan 15;75(2):503-13.